This can cause problems at your home as well. Uneven sidewalks, walkways and steps can cause tripping, and sunken driveway slabs can make parking your car in the garage quite a challenge. PolyLevel® is designed specifically to repair this type of problem in Cloquet, Two Harbors, Hermantown, St. Paul, Esko, Virginia, Ashland and the neighboring areas. The polymer consists of two separate liquids that are combined right at the injection nozzle to trigger a chemical reaction that turns the blended ingredients into expanding, high-density foam. The foam flows into voids and between loose soil particles, expanding to about 15 times its initial volume. This expansive action effectively lifts settled concrete. An experienced technician, like those at DBS, can control the application to create just the right amount of raising pressure. Ready to see why PolyLevel® is the superior choice when it comes to repairing sinking concrete in Duluth Superior Area? Get started by calling DBS at 1-855-259-9625 or contact us online to meet with one of our specialists today! 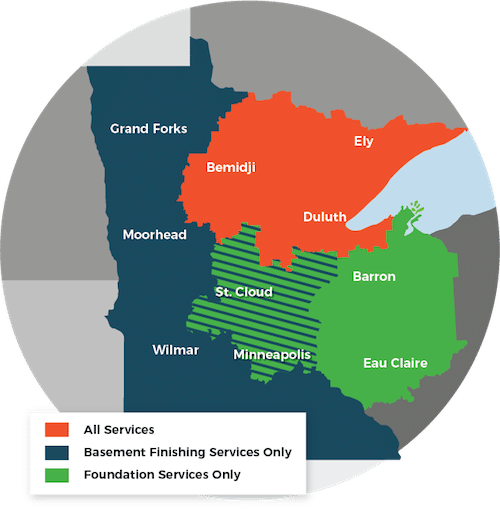 We provide written estimates for concrete repair in Duluth, Superior, Minneapolis and throughout the surrounding area.